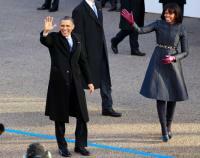 Having the flu gave me the opportunity to watch U.S. President Barack Obama’s inaugural ceremonies on Monday. As I watched, I wondered if I was observing an event that will help foster a new United States of America—an America that is inclusive of all people and enriched by an empowered citizenry. Obama’s speech was a clear expression of his personal beliefs and leadership philosophy and the vision he holds for a more fair and equitable society. It was a call to action—a call to all citizens to be engaged in their future by having a voice in their government. Granted Obama’s vision is not a vision shared by all, as transformative visions often are not, since they seek a new way of being and challenge many long held beliefs, assumptions, and norms of behavior. Obama’s vision calls us into a new way of being together, as Americans, being in care of one another, and supporting every person in reaching his or her potential. The speech and the inaugural event communicated a call to action to embrace difference and recognize it as a collective strength that can help us find common ground. I write a lot about the importance of “being in care,” especially for leaders and teachers. I see leaders as teachers and teachers as leaders, as both roles are core to creating transformative change. “Being in care” means that we are meaningfully connected to others, always in relationship, and always listening to the needs and acting from a place of what is best for the common or greater good. This is not an easy place to reside, especially for political leaders who find themselves in positions where compromise is often the only path forward. Obama’s expression of being in care was powerfully demonstrated at the moment he stopped to savor the meaning of the millions of people who were present for the ceremony. One could tell from his face, that this moment for him, was not one of power, but rather one of the extraordinary meaning of being president of the United States, a position from which he aspires to create transformative changes that improve the lives of those gathered that day and the many others who hope for a better future. One could feel his desire to be connected to those who he has inspired and who continue to inspire him. There is much need for transformative change in the U.S. and around the world. The challenges of climate change will likely continue to force us to change our way of life, including where and how we live. Strong, resilient communities are needed to face and recover from disasters. I was happy to hear Obama state a strong commitment to addressing the needs of climate change in his second term, as there are many proactive measures we can take to avert the impact of it on our lives. I’m hopeful these shared experiences and collective recovery efforts will serve to change the nature of who we are from a nation of separate individuals who all too often seek self interest to a nation of creative individuals working together to address our collective needs, locally and globally, while preserving and protecting the natural environment. The next four years are important years to reshape the way we participate as Americans in shaping the society we want our children and grandchildren to inherit. The transformative change President Obama will be able to achieve will be directly related to the actions each of us takes—individually and collectively—as leaders, teachers, parents, social change agents. How can we all engage in this change?